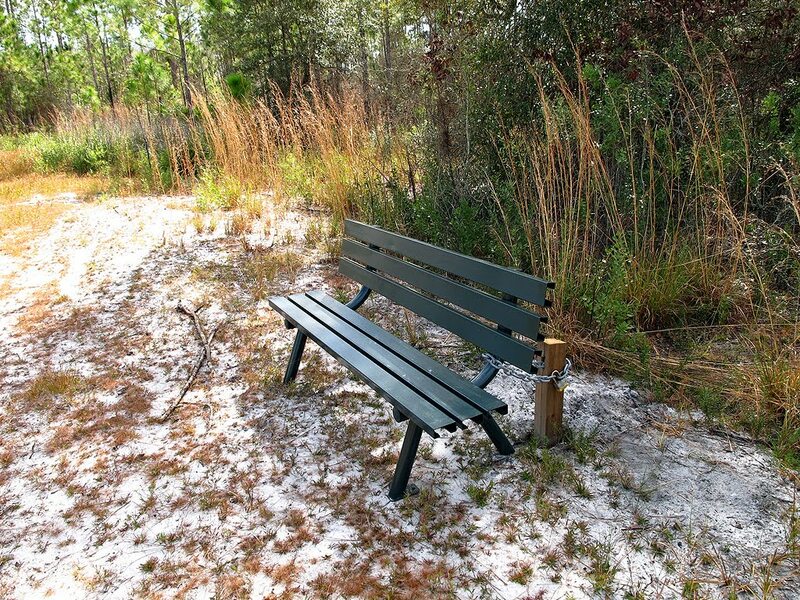 This is another of the “Green Place” preserves created by Orange County. 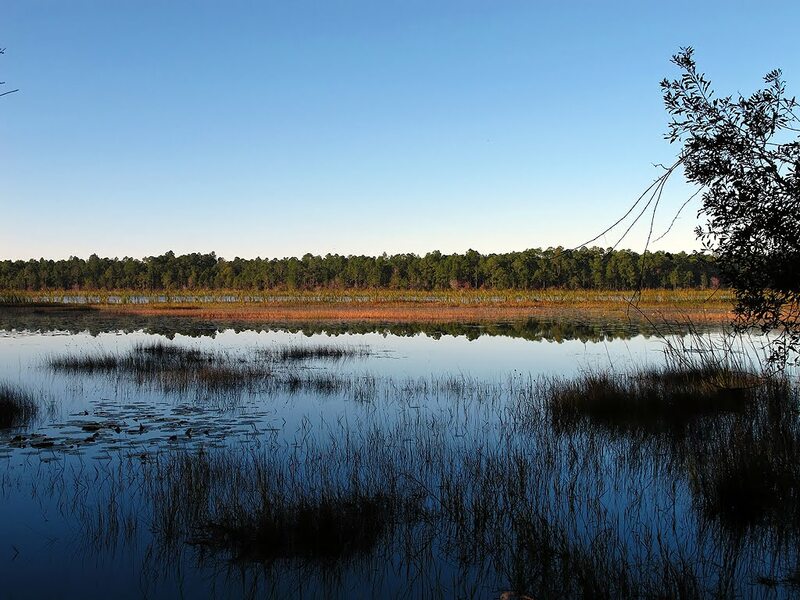 The preserve is reported to consist of 464 acres and was formally known as “Hampton Bay”. It was originally part of a Florida Homestead before developers purchased it. 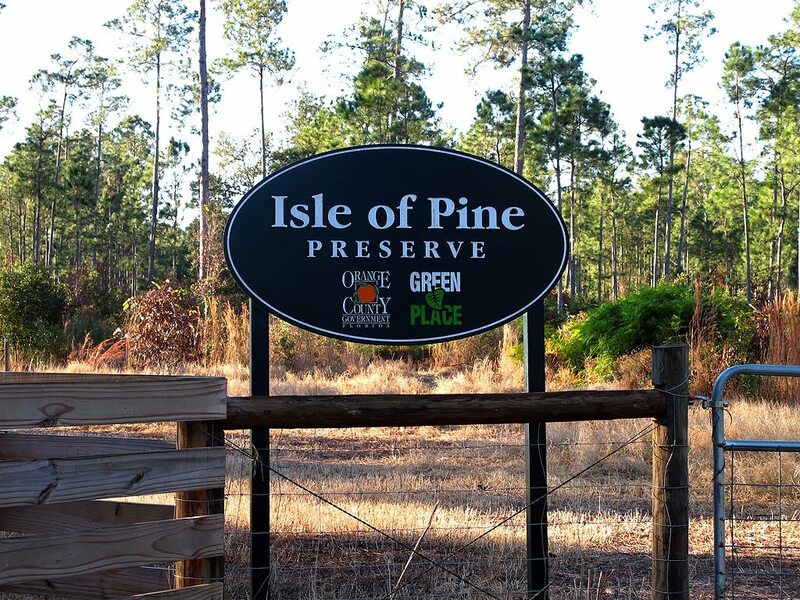 In turn Orange County purchased it from the developers and created Isle of Pine Preserve. It is bordered on the West by Lake Mary Jane as well as a canal, and on the other three sides by private property. All surrounding property is private and very well protected, so don’t cross any fences. I know that Desert Ranch owns much of the adjourning property and they do not take kindly to trespassers. Orange County’s Moss Park is just across Lake Mary Jane. Because much of the preserve is wetlands, there are two access points, one at the end of Lake Mary Jane Road and the other at the end of Lace Bark Pine Drive. Parking is provided at both locations – more details about that later. 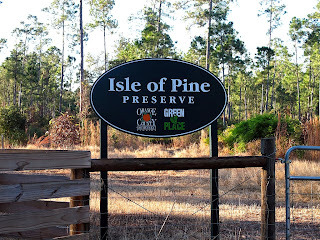 I found this information about the area while doing my research - Isle of Pine Preserve is composed of nine different natural communities, consisting mainly of basin marsh and mesic flatwoods, in addition to scrubby flatwoods and basin swamp. Main canopy species on the property include slash pine, longleaf pine, cypress, and black gum. 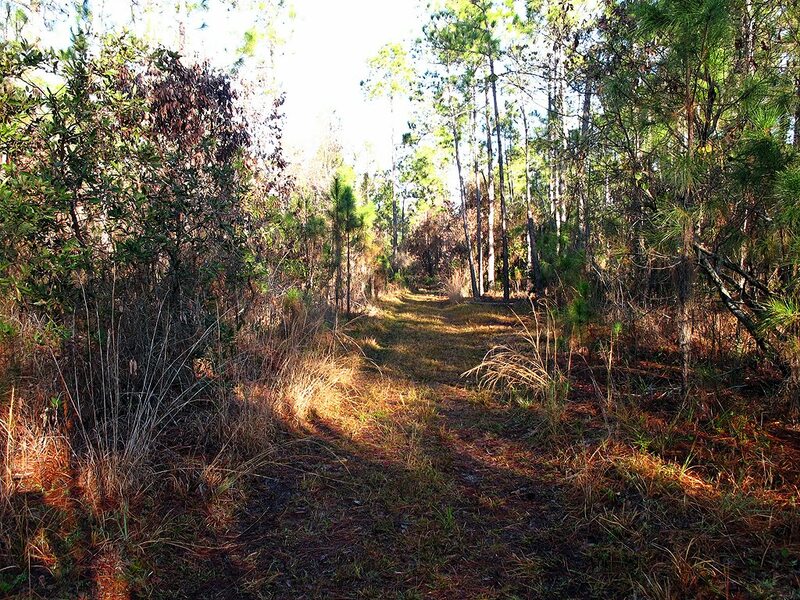 Understory species include saw palmetto, gallberry, fetterbush, and shiny blueberry. 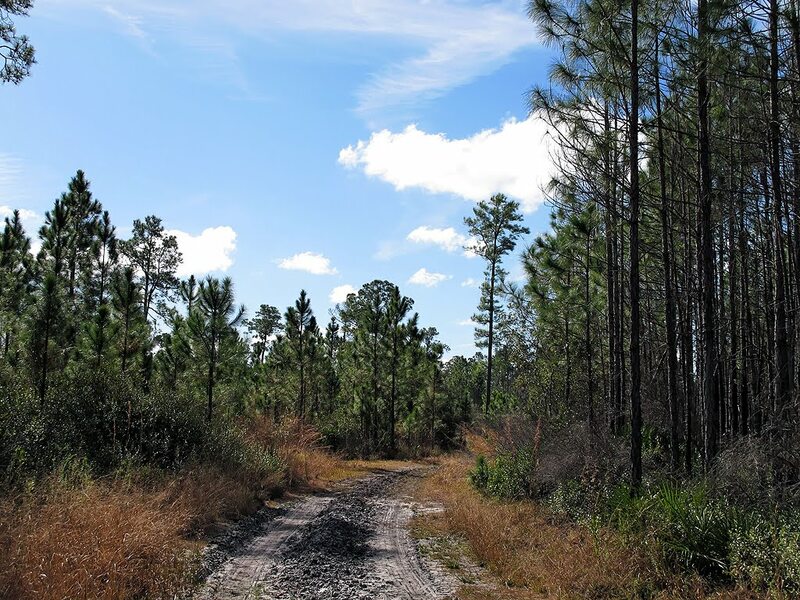 Other species commonly found on the property include several species of St. John’s wort, redroot, and wax myrtle (Myrica cerifera), as well as several listed plant species. Poorly drained soils are found on the west and south portions of the property. 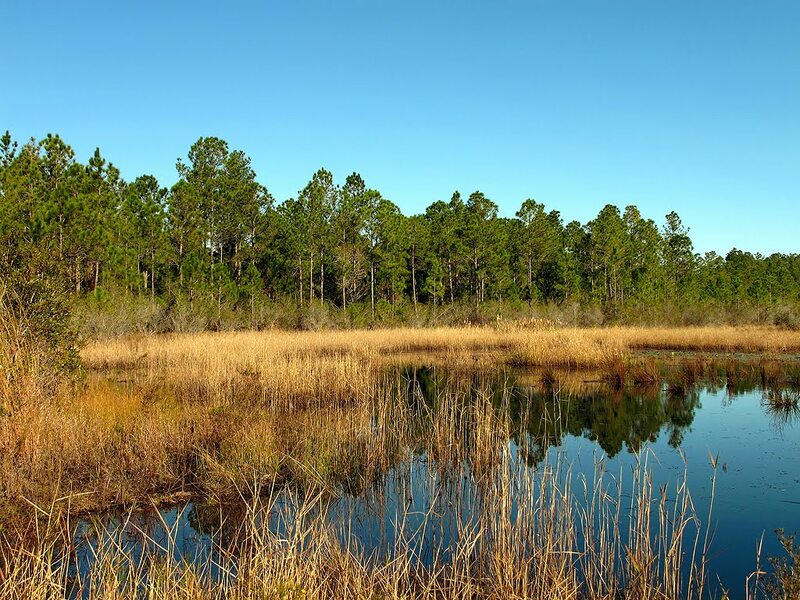 Cypress domes, basin marshes, and basin swamps are located throughout the preserve. On the western portion of the property a large basin swamp is directly adjacent to Lake Mary Jane. 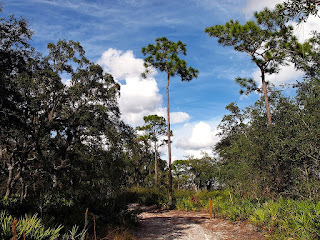 I spent a couple of days exploring the preserve and found much of the variety of natural communities mentioned above. 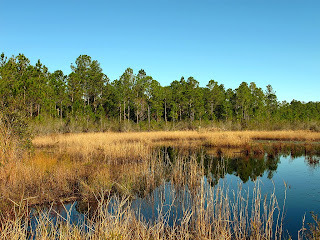 The major problem is that there are wetlands in the preserve, mainly over near Lake Mary Jane. You can just get so far before you hit major mucky areas. The local hog population likes the muck, but it always forced me to turn around. Depending on the access point you use, you will encounter two different worlds. One area is mainly the wetlands, while the other is mainly dry scrub lands. Because the preserve is not that large, you can wander from one eco-system to another. Once you hit the wetlands, you are pretty well done going any further in that direction. I never did find a way to get from the Eastside to the Westside without exiting the preserve and driving to the other access point. There are a few pretty ponds on the East Side of the wetland area. I enjoyed my lunch at a larger one. I did see some deer, turkeys and songbirds during my visits. There was a lot of hog activity in the area, hog trails and rooting, but I never came across an actual hog. They were there, but like most wildlife, they avoid people most of the time. Because of the wetlands, you might expect to hit mosquitoes at different times of the year, so be prepared. I did find a few areas and items that I felt were part of the old homestead which I am sure existed here once upon a time. That section consisted of cleared areas in the oaks, as well as some cinderblocks and wooden relics. As it seems with all Florida historical items, many things have gotten bulldozed under or burned out. I always feel someday this will be regretted by the powers to be when they want to know more about the county’s history. I did spot a few pine trees in a couple of areas which were used a long time ago to harvest sap with which to make turpentine. Just look for pine trees with major cuts in their sides. Usually if you look closer you will find a piece of metal in the cut used for the pots etc. If you do decide to try and venture West you will just hit wetlands. The tall pines along the trail are quite impressive. 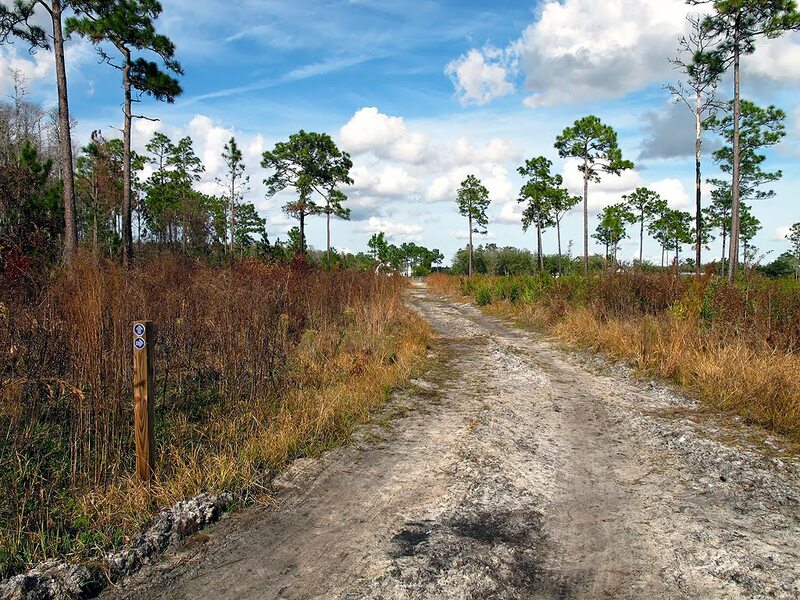 Orange County has marked two trail systems in the preserve, a green trail and a blue trail. In order to use either elected trail, you must park at the access point for that trail. 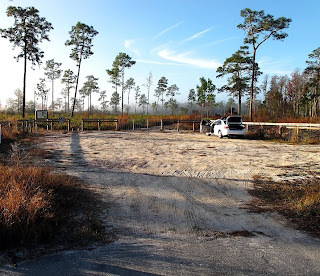 I found it almost impossible to get from one trailhead to the other without exiting the preserve and driving to the access point for the other trail. The green trail is accessed from the parking area at the end of Lake Mary Jane Road The blue trail is accessed from the parking area at the end of Lace Bark Pine Drive. Both trails are blazed using metal tags with directional arrows on posts. 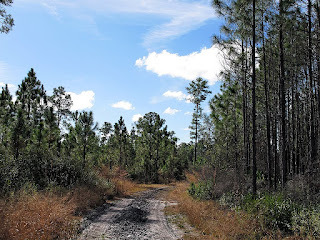 Both trails are mainly old homestead roads, so don’t expect to find nice trails wandering through the woods. There are no dogs, no bikes, and no motorized vehicles allowed on these trails. Horseback riding is allowed on the blue trail. There is no hunting allowed in the area, but as always, be alert to what is going on around you. The county would like you to stay on the trails, but at times the urge to do some wandering might set in. There are some old roads and game trails off the marked trails which I did give a look at times. The green trailhead is at the end of Lake Mary Jane Road. There is some question about parking at that spot, so that could be a problem. I have been told that this is a walkin entrance only. There are houses on both sides of the entrance area. The complete trail is only about 1 mile in length, out and back. There is an off trail which takes you to the edge of Lake Mary Jane, where you will get some views of the lake. That section of the lake is not developed, so you will see some of the old lake. The trail winds up a small incline to where it just ends and you have to turn around. 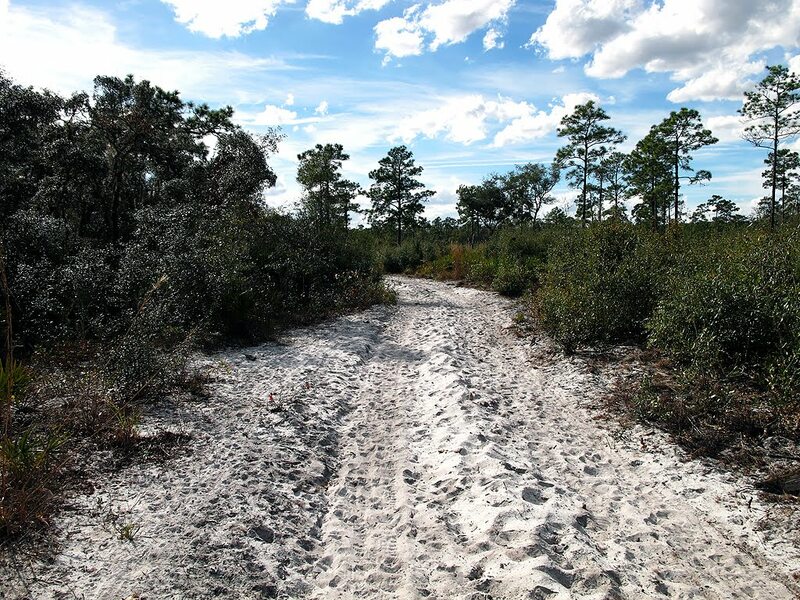 If you even tried going further than what seems the end of the trail you will encounter wetlands – depending on the time of the year you visit will dictate how much water you would encounter. When I visited the preserve in Jan 2012 there wasn’t any signs marking the end of the trail, you will just have to realize it. The last sign pointed me into the woods, which certainly was wrong. You have to turn around and head out. About .6 miles up the green trail there is a little spur off of it, you have to look for the blazed posts. This is a small loop which will take you over near Lake Mary Jane. There was a tree down across the trail when I did the loop, but looking around I did find the trail. If you are lucky you might spot some wading birds and water lilies in bloom while at the lake. So bottom line, though the green trail is short, it is a nice trail to walk. The blue trailhead is at the end of Lace Bark Pine Drive. There is a nice parking area provided by the county. Here you will find an information station, providing you with information about the area. This is also the entrance for the equestrian people. The complete trail is a loop only about 1.83 miles in length. The trail is actually just an old farm road. Some parts are packed down providing comfortable walking, while other parts are comprised of “sugar” sand, which can be cumbersome to walk in. The trail is almost completely in the sun, so take that into consideration. You can find some shady spots off the trail, which will provide some relief. The county has provided a picnic table on one spot of the trail and a metal bench on another part of the trail. I used these for two of my many breaks on the sunny day I visited the preserve. Between the sun from above and the sun bouncing off the white sand, I was a little warm. I suggest sunscreen and plenty of liquids on this short hike on a sunny day. 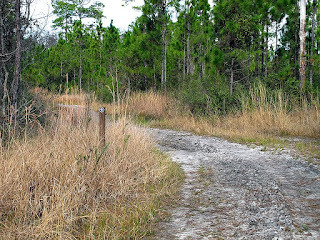 The road is bordered on the outter side by oaks, scrub pines and wetlands. On the inner side there is a large area of palmettos. I did venture off the main loop road onto another old farm road to get a feel of the rest of the preserve. You can only go so far East or South as you will run into barbwire which marks the border of the preserve.